The essence of every economy is growth. But the sad part is that for the sake of economic prosperity and competency, countries around the world have neglected environmental conservation and safety. Consumerism, which has grown at an unprecedented pace, got with it mountains of waste and no compensation for our mistakes. According to World Bank, currently, 1.3 billion tonnes of municipal solid waste is generated in the world every year and this is expected to increase to 2.2 billion tonnes by 2025. Studies have shown that higher income levels and increased urbanization mean more waste is generated because consumption levels increase with rise in disposable incomes. One of the most harmful waste being produced in abundance is plastic. Since the revolutionary invention of plastic in the 1950s, the consumer market changed. Plastics, being made at a rapid rate, have engulfed our very existence because it is cheap, durable, and lightweight. That’s how it became a key element in business operations such as storage, transportation, construction etc. In the past 50 years, plastic production has increased from 15 million tonnes (1964) to 311 million tonnes (2014), and is expected to double again over the next 20 years. In the age of consumerism, convenient and easy-to-use products have taken over the market and since plastic is cheap and durable, single-use plastics have become a very commonplace. Single-use plastics, often also referred to as disposable plastics, are commonly used for packaging items. These include, among other items, grocery bags, food packaging, bottles, straws, containers, cups and cutlery. A World Economic Forum report states that as of 2016, 95% of plastic packaging material value, or $80– $120 billion annually, is lost to the economy after a short first use. The most common single-use plastics found in the environment are, in order of magnitude, cigarette butts, plastic drinking bottles, plastic bottle caps, food wrappers, plastic grocery bags, plastic lids, straws and stirrers, other types of plastic bags, and foam take-away containers. Earlier this year, the European Commission 2018 took strict measures against the top 10 single-use plastics found in the oceans and seas around them. The 10 such items on European beaches account for 43% of total marine litter, fishing gear represents an additional 27% of all marine litter. The commission is acting in these two areas, which represent 70% of all marine litter found on Europe’s beaches. The problem India faces is that the rate of production of plastics, furthermore single-use plastics, is much higher than the global recycling rate. 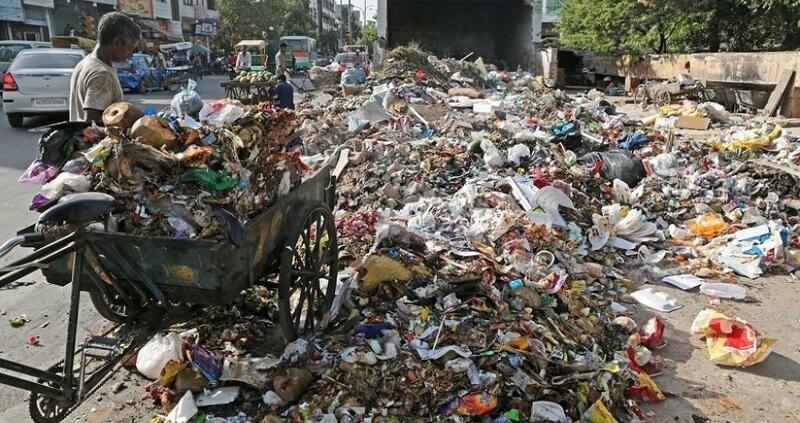 Therefore, the scale of waste management is minuscule when compared to the rate of waste generation. Although India’s plastic waste production isn’t as large as other developed or developing nations, the nation struggles with managing and disposing this waste. India has no data on single-use plastic waste because there is no definition for such plastics here. Another reason for this is that segregation of single-use plastics is an arduous task and a large amount of plastic waste is segregated and recycled by the informal sector. India must follow the footsteps of EU because there is an immediate need for us to classify our waste for it to be managed better. The ban on certain plastic products in 25 states/UTs gives hope, but the implementation so far has been subpar. A blanket ban will neither help vendors, nor consumers as neither of them are privy to the waste management mechanism to be able to phase out plastics. This policy intervention requires more than just legislation. Consumers form the market’s core and that’s why the process of eliminating single-use plastics must begins with us. The most obvious and necessary solution to this is reusing. We must move back to a culture of reusable products or alternatives to plastics (steel, wood, clay), such that the amount of waste generated is minimized. However, this requires a lot of investment, which may not appeal to all sections of society. Plastics being a considerably cheaper material compared to other raw materials, the cost to a consumer is also cheaper. This shows that innovative eco-designs must be encouraged. Consumers must also be encouraged to introduce cuts in using plastics. One of the most effective forms of incentivisation is taxation. For example, before implementing a tax, in Ireland, retailers gave out 1.26 billion plastic bags every year, with an average consumption of 328 bags per person per year. The government calculated consumers’ willingness to pay (WTP) for plastic bags and imposed a tax six times the WTP. With the help of smooth implementation and well-defined governance functions for different parties, within one year the use of plastic bags in Ireland dropped by more than 90% and the consumption per person fell from 328 plastic bags per year to 21 bags. Likewise, while before the 2002 levy, plastic bags accounted for 5% of the national waste, in 2004 this number fell to 0.22%. We have reached a point where our actions have cost us severely and investment in environmental protection is essential. Investment from the government can only be funded by the revenue it earns, and it’s time we are taxed for our behavior. The WEF Report estimates that by 2050 there will be more plastic in the ocean than fish. The way we have been “moving forward”, it is highly likely that it won’t just be the fish swimming in our waste. Government must buy back all existing carrybags in circulation - like the demonetization which they should do a "depolythenization exercise fast!) Then the government must fill in the bag gap with earth friendly substitutes of all kinds, such as jute, cloth, paper, etc.